According to statistics, there are about 100 million persons suffering from mental health conditions in China, of which, 16 million have severe conditions. Mental illness and disability have become the biggest economic burden among all diseases. Although it has received more and more attention from government at different levels and relevant sectors, financial inputs has been increasing yearly, the main intervention is still medical treatment in hospital and at home. The present situation of persons with mental health conditions in China can be described two “90%”, i.e. 90% of persons with mental health conditions stay at home and 90% of their time is spent at home. Without sufficient support from communities, they normally fall into a various cycle called “revolving door” phenomenon between hospital and family, which lead to repeated illness and gradually become disabled. With joint efforts, the first phase (2011-2014) of EU-funded Action has successfully reached its objectives to integrate mental health care into primary health service in 3 districts of China. i.e. Haidian district in Beijing, Changchun and Tongling. The second phase was also launched in Harbin and Yanqing districts on the 1 March 2014 with aim to implement policies and laws at international and national level that address mental health and human rights, i.e. 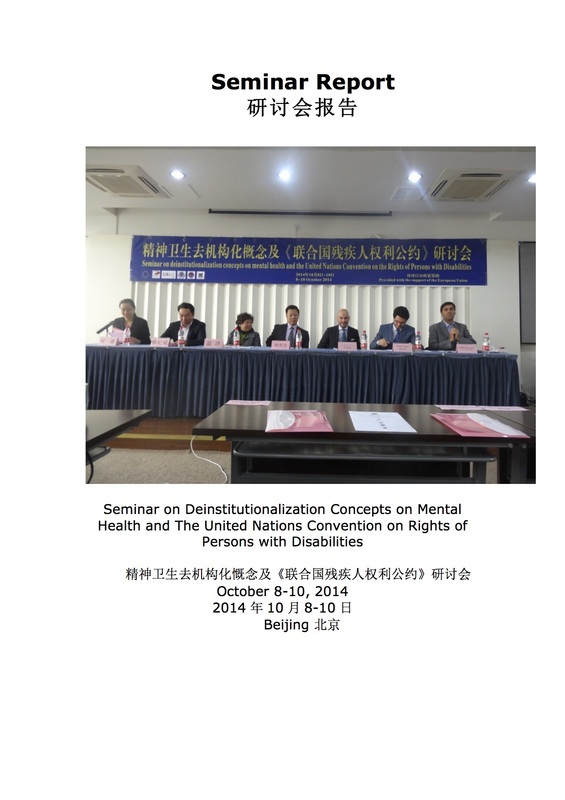 United Nations Convention on Rights of Persons with Disabilities (UNCRPD) and New Mental Health Law of China. It is necessary to introduce relevant disability/mental health development concepts and trend to partners so that their understanding and approach towards mental health will be shifted from pure medical model to social and human right-based model. With the effect of new Chinese mental health law, it has been anticipated that there will be a rapid shift from hospital based psychotic care to community based mental health. The seminar was an important platform to bring major stakeholders like government sectors, institution and NGOs together, in order to discuss how successful experience of deinstitutionalization in western countries can be implemented in Chinese context. This seminar was held during the “World Mental Health Day”, thus, it was also an important event to advocate to government, professionals and the public on the rights of persons with mental health conditions. The seminar had honor to have the following distinguished guests to the opening ceremony and made remarks. Short time was allocated to each speaker, but a lot of important issues were addressed and useful information was shared. The following is the summary of the opening ceremony. - Community mental health has been developed in Italy for over 50 years, it is meaningful to work with Chinese partners to develop it in Chinese context. - EU supported Action has greatly promoted the mental health development in China and it also shows NGO can play an important role in social development; the Action also facilitated the cooperation and dialogue between NGO and government. - The current environment for mental health development in China is favorable, i.e. China has ratified UNCRPD, relevant policies and laws were issues accordingly, e.g. Suggestions on Further Promote Disability Development by the State Council issued in 2008; Law on Protection of Rights of Persons with Disability was revised in 2008; improvement of both Social Security and Service System were included in national social and economic development; New Law on Mental Health was approved on 2013, 1 May; Regulations on prevention of disability and rehabilitation are under process for approval etc. Although mental health was started in a late stage in China, it has been gradually integrated into framework of legislation, working system, public service and social-economic development. - As a public health issue, Government should take major responsibility for mental health. Take CDPF as example, its major funding is from government at different levels, NGOs mainly provide technical support and pilot projects for demonstration and advocacy. - Community mental health is the direction, but it should be developed step by step based on Chinese context. Deinstitutionalization can only be done when communities have capacity to meet needs, e.g. a big shortage of social worker in communities is one constrain. - The central government and 18 relevant government sectors are taking leading role for mental health in China and they will have a meeting soon to discuss how to further promote community mental health. - Due to stigma and discrimination, most of persons with mental health conditions either stay in hospital or at home, it is very difficult for them to access job and other opportunities, thus, it is important to improve capacity of communities. - China Association of Persons with Psychiatric Disability and their Relatives has 3 committees, i.e. Family Member Working Committee, Autism Committee and Community Service Promotion Committee. Promotion of community service is one priority of the Association. - For long period, services for persons with severe mental health conditions were focused on “treatment and control”; this should be changed, persons with mental health conditions have potential and capacity, their human rights and dignity should be respected. 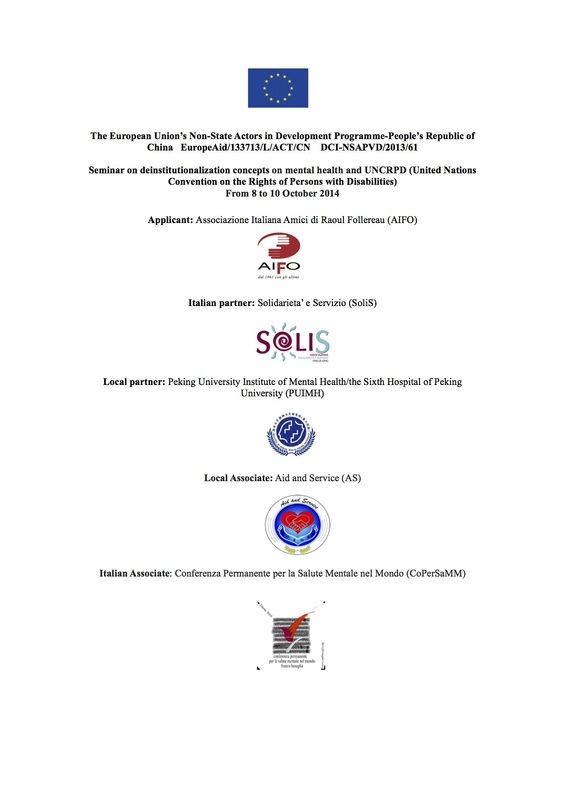 - The EU-funded Action has been implemented based on model and experience of Italy; Chinese context should be considered when developing mental health. Following the objectives of the Seminar, a number of presentations was given for information and experience exchange. The UNCRPD highlights that persons with disabilities include those who have “mental impairments” and emphasizes the need to: 1) ensure their full and equal enjoyment of all human rights and fundamental freedoms; and 2) promote their participation in civil, political, economic, and cultural spheres with equal opportunity. Mr. Giampiero Griffo, representative of Disability People International (DPI) in Italy and Mr. Kirihara Naoyuki, representative of DPI Asia Pacific Japan gave an overall introduction on contents and principles of UNCRPD, highlighted articles which are closely linked to persons with mental health conditions. Mr. Naoyuki also briefed the development of mental health service in Japan and how persons with mental health themselves pushed those changes. Both presentations showed that mental health is not a pure medical issue, but psychosocial issues; thus, a paradigm shift from medical model to social and right-based model is the key for mental health development. Our work should aim to ensure that dignity and human rights of persons with mental health conditions are respected. As China has ratified UNCRPD, it is the Country’s responsibility to develop laws, policies and actions to implement them to ensure the human rights of persons with mental health conditions. In this aspect, there is an urgent need to move the current institutional focus to community-based approach. Dr. Tang Hongyu from the Sixth Hospital of Peking University participated in the consulting and research of mental health legislation. He gave a brief introduction on the new law. After 27 years’ efforts, China finally passed the first Mental Health Law. The new Law was developed in line with country situation and learning from international mental health laws and experience. The new Law aims to speed up the mental health development, to standardize the mental health service and to protect rights of persons with mental health conditions. The new Law also focuses on solving the current outstanding issues based on reality, i.e. to balance the rights of patients and safety of the public, to well combine prevention, treatment, rehabilitation, service and management, to establish mechanism with clear responsibility of all stakeholders. The concepts of developing community rehabilitation units is also included in the Law, the specific model or approach should follow the local situation, such as, day care center, half-way home etc. Based on the new Law, China will make efforts to strengthen both institutional and community services. Every Province was requested to develop and implement policies accordingly based on local situation to ensure the implementation of the new Law. Relevant government sectors and institutes need to include implementation of the new Law into their responsibilities, i.e. Health, Civil Affair, Police, DPF, Education, Finance，Hospitals etc. Among the project sites, Changchun city has developed a regulation based on the national new Law and local situation. This is the largest mental health project in the world initiated in 2004 by National Health and Family Planning Commission. The outbreak of SARS in 2003 exposed the weakness and problems of the public health system in China, consequently, the center government allocated CNY 3.7 billion to improve the public health system, of which, CNY686,000 was utilized for improving mental health services. In the past 10 years, the project has gradually moved from “control of persons with severe mental health conditions” to “management and treatment”; it has been also developed into routine practice from a project through establishment of sustainable working system and mechanism. The project greatly mobilized resources to provide medical care and rehabilitation services in both institutions and communities, so far, 4 million patients were registered in database, 3.25 million persons have received follow up and family support, subsidy was provided to almost half million poor patients for medication and hospital treatment. Capacities of human resource were improved through two-level training, i.e. national and local. This project has made great achievement in terms of providing basic health care and rehabilitation services in a wide coverage (covers 1926 counties/districts in 275 prefectures). Since the new Mental Health Law is taking effect and inputs from government will be increased accordingly, more efforts will be taken to further strengthen the institutional and community services. It is very encouraging to see achievement and positive changes happened in the past 3-years, which has laid solid foundation for the second phase of the Action. - Districts government paid attention to mental health after all advocacy and leading groups were established to provide policy and financial support to the Action, which consists of relevant government sectors, i.e. health, civil affair, social security, finance, education, DPF, media, etc. - A working mechanism/system of leading by Government with cooperation of Government sector and participation of society was primarily formulated, which is important for resource mobilization and network. Collaboration has been established with major stakeholders like DPF, Civil Affair, CDC, community Committee etc., each of them has a role. - Psychiatric hospital and community health centers were working together to provide accessible and affordable services to people with mental health conditions. Capacity of community health centers on mental health care and rehabilitation was improved, meanwhile, hospital started to involve in public health work. Working opportunities are opening to users. - Establishment and running of ROUs brought advanced model of service, which provide opportunities for users to obtain various skills for their social participation and inclusion. - International experience and local situation were well combines. - Capacity of professionals of hospitals was improved, especially, for Community-based Mental Health. Doctors do not passively wait patients in the hospital, but deliver service to communities proactive. - Awareness of community on mental health has been greatly improved. - The Action has been linked to other existing projects/progamme like 686 Project, national mental health project for persons with severe mental problems, foster and care center run by DPF etc. - Families received needed support, such as information, counseling etc. - The proportion of mental health is too low among the work of community health center. 社区卫生中心的工作中精神卫生比重低. Three experts from Italy, Dr. Giovanna Del Giudice, Dr. Francesco Colizzi and Dr. Alberta Basaglia shared the experience on mental health development in Italy, concepts of community mental health and practice. During the Seminar, the issue on how to balance the safety of the public and the rights of persons with mental health conditions, especially for those with server conditions, was raised. Both Dr. Giudice and Dr. Basaglia responded this through introduction of experience and practice in Italy. Before 1960’s, persons with server mental health condition in Italy were also regarded as “dangerous people” as they might harm others, there was very serious stigma and discrimination from the society, therefore, strategy and solutions were put them under “control” through “obligatory treatment in isolated hospital”, of course, in such situation, it is not possible for this group of people to have their rights and dignity. Luckily, started from 1960’s, Dr. Basaglia initiated advocacy on human rights of persons with mental health conditions by breaking the traditional understanding: to establish open hospitals, to have humanized relations among professionals, patients, families and member of societies, to give patient right to express themselves and respect to their life etc., however, the situation wasn’t changed immediately. Through consistent efforts, in 1970’s, patients finally realized the right of free treatment with protection by law. Treatment and rehabilitation has been gradually moved from psychiatric hospitals to communities, patients’ right as citizen were respected. Consequence, psychiatric hospitals were closed. Generally, deinstitutionalization is a trend worldwide, since 1950’s, a lot of countries already started process of deinstitutionalization. Deinstitutionalization doesn’t mean close all psychiatric hospitals immediately, it took decades for Italy to close psychiatric hospitals after a lot of research, discussion and development and improvement of community service, because there should be adequate services to replace hospitals. However, as deinstitutionalization is the direction, it is important to start the process by prioritizing actions towards mental health. The change should start from psychiatric professionals and staff so that patients will be treated with freedom. Dr. Franco Colizzi elaborated the concepts of community based mental health, which aims to provide to support to persons with mental health conditions to participate and include in all aspects of community life, their dignity and rights are respected. Mental health conditions are actually found in people of all ages, regions, countries and communities. It is estimated that approximately 25-30 % population have mental health conditions, and that one in four people will be affected at some stage during their life. Community Based Rehabilitation (CBR) is an important strategy within general community development for the rehabilitation, poverty deduction, equalization of opportunities and social inclusion of all people with disabilities (CBR joint Position Paper by ILO, UNESCO and WHO). Mental health is included. Key concepts of community mental health: Mental health is an important part of community development and persons with mental health conditions can contribute to the development; the vicious cycle among poverty and persons with mental health conditions should be broken: common myths and traditional understanding about mental health conditions should be reduced/eliminated, such as mental health conditions are uncommon, people with mental health problems are violent and endanger the safety to others if they are allowed to live in the community, it is difficult to treat and people will never get better, it is brought on by weakness of character etc.. Therefore, mental health should be promoted in communities; various supports and services should be provided to help persons with mental health conditions and their families, such as access to medical care, psychological support, social participation, and livelihood opportunities etc. Specific issues related to mental health: children and adolescents, gender, crisis situation like disaster, war etc. People with mental health conditions, their family members and communities are central to community mental health; they should be empowered to fully participate in all stages of the development. Self-help group (SHG) is proved an important strategy to empower person with mental health conditions and their family members. Due to translation, time for discussion is very limited, but some important issues/questions were raised during the seminar. This issue caused very hot discussion. Representatives pointed that China has ratified the UNCRPD and approved the new Mental Health Law; the isolated institutional treatment and control should be changed. Limited resource should be utilized for development of community as provision of community service is the direction, the focus on community should be started as early as possible. - Number of patient is still increasing. The capacity of current service is far behind the need in terms of number of psychiatric professionals and beds allocated. - Communities are not ready to take responsibilities, there is such a dearth of mental health resources in the community, and the absence of well-trained mental health social worker is just an example. - The community health system is not equipped to handle the surge in outpatients that would occur if severely ill patient refuse to be treated in hospitals. Take Changchun city as example, there are 220 communities, it is impossible to allocate one doctor to each community health center. - Community and institution should be supportive and supplementary to each other. The institution can provide necessary medical care while community can do screening, referral, follow up support to patients and family members, and awareness rising in the communities. - In 2009, Chinese invested CNY 9 billion for hospital development; future financial inputs will focus more on community. - It took decades for Italy for the process of deinstitutionalization, thus, the transition in China will also take time and Country context should be considered. - There are also constrains from institution, e.g. patients can get re-imbursement for hospital medical care based on the current health insurance system. With the support of the project, both Changchun and Tongling cities have established ROUs within in hospital, however, it is still very difficult for them to open new unit outside of the hospital and replicate the model in a large scale basis in the near future due to constrains of human resource, funding, mechanism etc. There is no problem for sustaining the current project through collaboration with DPF etc. 3．How should the rights of patients and the safety of others be balanced? 如何平衡病人的权利和其他人的安全? There is still a big concern on harm that persons with severe conditions may cause to others, thus, how to balance the rights of patients and the safety of others is still an issue. This is however a big myth and misunderstanding, which lead to discrimination and exclusion. Obviously, effort still needed to raise awareness on mental health. Article 54 of the new Mental Health Law states that“community rehabilitation organizations shall provide a venue and facilities for persons with mental disorders needing rehabilitation, and operate rehabilitation trainings for them in areas such as self-assisted living skills and social adjustment skills.”Community rehabilitation unit including various vocational training center, work and treatment unit, agriculture and treatment unit, day care center, foster and care center, midway home etc. Dr. Yao Guizhong, Doctor of Medicine, chief physician, tutor for Master students, Deputy Director of the Sixth Hospital of Peking University. Member of Experts Group on “Central Government’s Subsidy to Local Management and Treatment on Severe Mental Illnesses Specification Project”, Experts Group leader of Severe Mental Illnesses under “National Basic Public Health Service”, expert on popularization of science and health in Beijing Health Bureau. He has been engaged in psychosocial rehabilitation on mental illnesses, family intervention on the disease, practice and study on prevention and control of mental disease at communities for a long time. He organizes “ Series of Lecture on Mental Health Knowledge“ throughout the year, he is chief editor of Mental Rehabilitation Newspaper, has created mental rehabilitation bases and explored intervention service model for mental disorders of the integration of hospital and communities in Haidian district, Beijing. He has written over twenty articles and Participated in more than 10 psychiatric monographs. Dr. Tang Hongyu, male, chief physician in the Sixth Hospital of Peking University, director of ethics committee; director of psychiatric physician session under Chinese Medical Doctor Association; He graduated from Hunan Medical Institute in 1987, received master’s degree from Peking Medical University in 1992, he went to University of Melbourne and Harvard University for short term study in 2003 and 2012. From 1999 to 2007, he participated in consulting and research in mental health legislation. Since 2001, he has been in charge of many national projects on mental health service and training, formulation and amendment of standardized training outline and detailed regulations on in-patient doctor behaviors. He is specialized in Clinical Psychiatry and Psychiatric Ethics and Law. Ms. Ma Ning, Doctor of Medical Science, she got master’s degree in Public Health, she is deputy director of Public Health Department in the Sixth Hospital of Peking University, office director of Mental Health Center under China’s Center for Disease Control, secretary of Emergency Expert Advisory Committee on Psychological Aid Group. She was a visiting scholar to University of Rochester in 2009. She has been majorly involved in community based mental health service, rehabilitation treatment on severe mental illnesses, research on mental health policy, one National Natural and Scientific Funds and one capital health development research. She has published fourteen essays in the name of the first author, five SCI, participated in two psychiatric monographs. Currently, she is in charge of the central government’s subsidy to local mental health projects and management system of information on national severe mental disorder. Dr. Chu Wenge, deputy director of the Third Hospital of Tongling, psychiatric doctor and associate chief physician. Dr. Deng Hua, psychiatric doctor in the Sixth Hospital of Changchun；Director of Intervention Center on Psychological Crisis in Changchun.